As I alluded to in the DotNetNuke 6.2 Beta announcement, we now have two popular modules that are integrated with some of the exciting new features in 6.2. On Monday, Chris Paterra announced the release of Blog 5.0 Beta. Today, I’m pleased to announce the release of Active Forums 5.0 Beta. I should probably provide a quick status update on this project first. We had originally planned to create a new forum module which was the best of Active Forums and the current Core Forums. After a few months of progress on the new module and a lot of feedback from customers, we decided to continue using the Active Forums codebase and stop development on the new module effort. Active Forums source code is now hosted on CodePlex. This will be the primary location for downloads and keeping up with all aspects of the project. Please use the CodePlex Issue Tracker for submitting bug reports and feature requests. What’s New in Active Forums 5.0 Beta? Please keep in mind that this is a beta release. While there isn’t a long list of new features, there have been numerous changes in preparation for making this module open source. A large amount of code has been changed and we still have some additional clean-up work to complete. I also need to point out that this particular release has been created specifically to take advantage of the new capabilities in DotNetNuke 6.2 Beta. We will continue to make updates as we get closer to the final DotNetNuke 6.2 release. Active Forums has been updated to support the new Journal in DotNetNuke 6.2. This is a complete integration with ease of use in mind. All topics and replies are automatically sent to the journal at the time content is approved. This could be immediate or after a moderator has reviewed the post. We’ve also made it easier to remove content as well. The new Journal API allows 3rd-party modules to remove content they previously created. 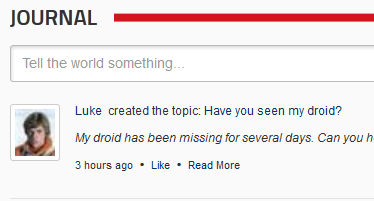 When you delete or change content in a forum, the journal is immediately updated as well. Moderation in Active Forums is now handled through the DotNetNuke 6.2 Message Center. Posts that require approval are sent as notifications to users that have been identified as moderators. Moderators can quickly approve, reject or delete posts in one simple view. Content alerts or flagging of inappropriate content was never very robust in Active Forums. That has changed with DotNetNuke 6.2. Notifications are sent to moderators when users flag content as being inappropriate. Moderators can easily see the reason, comments and the original content of the post. A link to the original content is also included. Moderators can then easily take the appropriate action on the content. We still have some more work to do on this version of Active Forums. We are also working on a migration path from the current DNN Core Forums to Active Forums. We will be looking for beta testers for the migration process very soon. In the meantime, download DotNetNuke 6.2 Beta, Active Forums 5.0 Beta and Blog 5.0 Beta and start thinking about all the cool sites you are going to build with DotNetNuke!